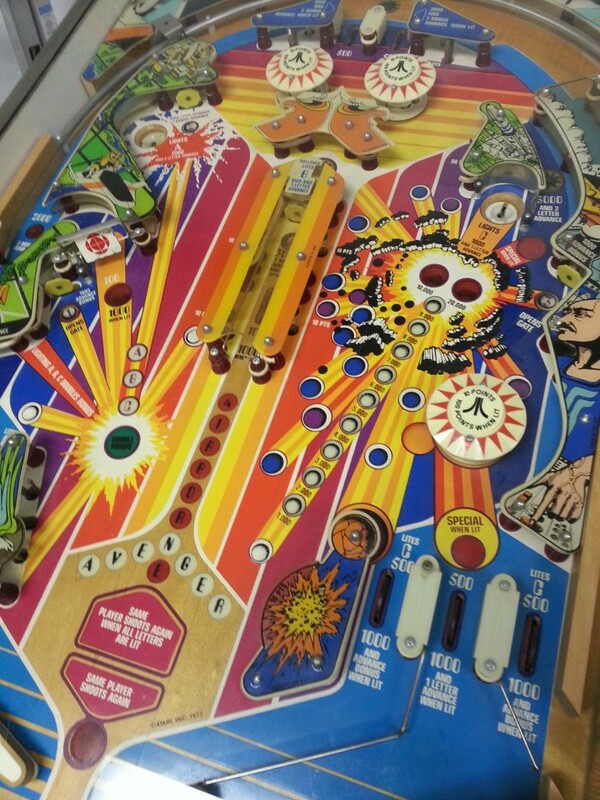 First Look: Atari Airborne Avenger – Steve Ritchie’s first pinball game! Funny story how I picked this game up… I was in Dallas at TPF and basically I noticed this odd machine in the back of the exhibit hall with a “for sale” sign on it. I knew the guy selling it, called him on the phone and made a quick deal. What’s funny is he picked up the game earlier in the day after some local saw a pinball machine in his truck, pulled off the road and said, “Hey you like pinball machines? I have one at my house about a mile away, want it?” And he went over, grabbed the game, threw it into the exhibit hall for a quick flip. It’s funny how these things turn out. This entry was posted in Uncategorized and tagged atari, Steve Ritchie by admin. Bookmark the permalink. I have an Atari Airborne Avenger. It was in a shed behind a fake wall (for many years, water had gotten to it). The head fell apart before I was told about it (most of the paint gone from the head glass). The machine was sitting on its back with no legs. When I opened the coin door a 12 inch rat snake was starring at me (about 3 inches from my nose). When I got home I got the snake out and let it go in the woods (many miles from my home). Most pf plastics are good, pf is shot and the body is shot. The electronics look good and original. All of the pf parts seem to be there. The tilt bob is missing. Thank you for telling where the scores were at (I did not look into the pf). So it looks like I am out to sell some Airborne Avenger parts. If you or someone you may know are interested please let me know. A snake. . . . in a pinball machine! ! ! ! I might actually be buying one of these soon. Depends on if the deal goes through. I am interested in knowing more about this machine and what was wrong with it!